The number of people from Togo assisted by the Immigration Project is increasing and staff members expect this trend to continue. “In Africa we always talk about coming to the United States,” says former Immigration Project client Komi. “This is the country where we have a lot of opportunities to have a better life. That’s why I came here.” Komi graduated with a degree in Political Science and International Studies from Western Illinois University. He currently works for the Illinois Department of Human Services. “My dreams became a reality.” Komi said when asked about how his life had changed since coming to the United States from Togo. 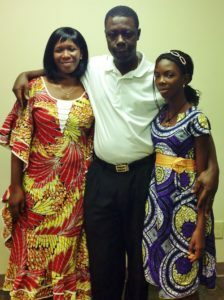 Like Komi, many Togolese clients come to the Immigration Project seeking assistance applying for citizenship and bring family members over to Togo, according to Executive Director and Senior Staff Attorney Jasmine McGee. Shortly after Togo gained independence from France in 1960 Gnassingbe Eyadema seized power in 1967 through a coup and held power until his death in 2005. His son became president after his passing and remains in power. Though Eyadema’s son allowed more multi-party participation political stability remains elusive, due to the questionable legitimacy of elections and rampant corruption. According to the World Bank in 2014, corruption was especially high among prison officials, police officers, and judicial officials. Despite growth in recent years, Togo is an impoverished nation with a life expectancy of only 59 for men and 61 for women. Since 1982, the United Nations has classified Togo as one of forty-eight “Least Developed Countries.” Poverty is especially prevalent among female-heads of household and in rural areas. According to UNICEF the Togolese population is nearly 7 million, but over 3 million Togolese are children under the age of 18, 1 million of whom are under the age of 5. In 2015 the World Bank found that Togo had an infant mortality rate of 52 per 1,000 live births, whereas the United States’ rate was 6. UNICEF found the mortality rate for children under 5 to be 85 per 1,000 live births. HIV/AIDS, tuberculosis, and malaria remain major causes of death in Togo. The CDC also found higher levels of typhoid, yellow fever, and meningitis in Togo. Poor health conditions are exacerbated due to inadequate sanitation. In 2015 the WHO found Togolese had the third worst access to toilets in the world, with only 10% access in many rural areas of Togo. Togo is a very diverse nation in terms of ethnicity, with an estimated twenty to forty different ethnic groups. There is not a majority religion practiced in Togo. Scholars from the University of Lome estimate that 33% practice traditional indigenous religions, 28% are Roman Catholics, 14% Sunni Muslims, 20% Protestant and 5% are unaffiliated. It is also not uncommon for Togolese Muslims and Christians to also participate in indigenous religious practices. The official language of Togo is French, but according to Pew Research Center there are approximately thirty-nine different languages spoken in Togo. The International Organization for Migration reported that in 2015 5.77% of Togo’s citizens lived outside their country of origin.Togolese immigration to the United States increased during the 1980s as the political situation grew increasingly unstable and extreme poverty persisted. “Many of our Togolese clients come over on the Diversity Visa,” explains McGee. There are a limited number of Diversity Visas available to people from countries with historically low rates of immigration to the United States. No country may receive more than 7% of available Diversity Visas. With decades of continuous poverty, government corruption, and inadequate resources to remedy either, Togolese immigration will continue, especially through opportunities such as the Diversity Visa, during the twenty-first century.